Featured images are the ultimate example of “You only get one chance to make a first impression.” If your feature image just isn’t that compelling to look at, you’re not going to drive many clicks. Finding the right images is an incredibly important part of any type marketing and content is no exception. And an image that makes people laugh is going to make more strides than a pretty but uninteresting photo that might not be indicative of further humorous content within. Here’s what you should keep in mind when choosing a featured image that you want to elicit raucous laughter. Choosing an image is a different challenge than comedic writing as it’s the first thing people will see before they even read the actual content. The image needs to appeal to them and also convey some relevance to the topic at hand. Tim Wash, a humor writer turned marketer, says that a common mistake marketers and communications experts make is overcomplicating things. While more prescient in written content, it’s also possible to just take forever when deciding on the right image because you want it to be precise. Just keep it simple! Go for bright colors and rich composition with the subject(s) in the photo indicating humor with facial expressions, the use of irony or hyperbole, or just a silly concept like a dinosaur in a tux. Pictures of people laughing only tell so much about the content within. What about a totally absurd and silly concept like the aforementioned dinosaur in a tux? 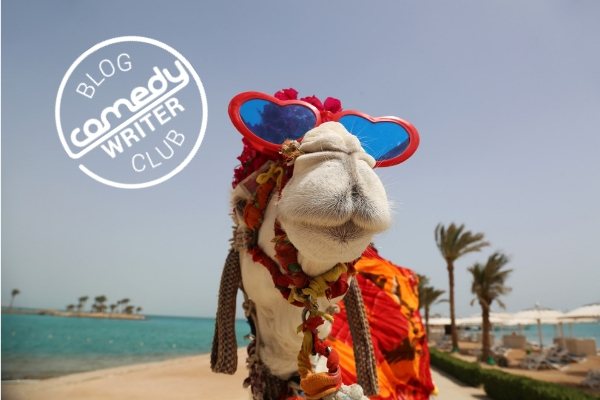 Check out some of the other Comedy Writer Blog Club post featured images to see why they’re hilarious and make people want to click on them! Some of the images are pure absurdism while others a little more in your face with silliness. Ultimately though, what makes things funny is that they’re often unexpected. Jokes aren’t that funny when you can see them coming a mile away or they’re overplayed. We’ve all seen those images of animals in suits to illustrate mishaps at the office, but did you expect to see this kind of featured image? You can keep things simple but also keep elements of surprise and novelty. Working with memes can be a blessing or a curse. Memes can be a gift from the humor gods or subject your brand to endless derision if you misapply them. Memetic featured images can definitely compel people to click but always check Know Your Meme first to make sure that the meme doesn’t have questionable origins that could alienate your audience, or serves as a symbol antithetical to your mission statement. This should go without saying, but don’t punch down. Don’t use more “acceptable” forms of bigotry like making fun of someone’s body size, features, and so forth where the image could convey that. With that said, there’s nothing wrong with an image that takes an embarrassing problem people can relate to because it makes them feel this parallel empathy where laughing about it is just the best way to cope. Got the runs before interviewing for that dream job or make this horrific foible on a long-awaited date and the thumbnail image clearly shows this? That makes for a click-worthy feature image because potential readers would want to know why it relates to the topic at hand! Laughter is the best way to put people at ease for both intimidating and unpleasant topics, after all. When all else fails, just test out the featured image with people around you– at the workplace, home, or total strangers. Just show them the image and ask if they think it’s funny and why. If it doesn’t elicit much of a reaction or people tell you why it’s unfunny or offensive, that’s your cue to pick a different image. Don’t be afraid to be a little bold and ironic when choosing a featured image but keep it light-hearted, simple, something that doesn’t punch down at anyone, and most of all, fun.